Barons Nathaniel and Albert von Rothschild, Vienna. Baron Alphonse von Rothschild, Vienna. Seized following the Anschluss in 1938. Restituted to the family in 1999 and subsequently sold Christie's, London, 8 July 1999, lot 204. With Segoura, Paris, from whom acquired by the present owner. Vienna, Österreichisches Museum für angewandte Kunst, 1948-1999. The sinuous lines and beautiful harmony of the chinoiserie decoration and flowing rocaille bronzes, marks this superb bureau plat as one of the finest examples of the mature style of Jacques Dubois of the 1740's and 1750's. Although Dubois did not receive his maîtrise until the age of forty-eight, he was almost certainly employed in the atelier of his half-brother, Noël Gérard from the late 1720s, the latter acting as witness to his marriage in Paris in 1730. Established in the rue de Charenton, Dubois enjoyed the privileges of an ouvrier libre and was thus unfettered by the strict guild regulations endured by his fellow ébénistes. Although Dubois' career is thinly documented, he is known to have worked for the marchands-merciers Léger Bertin and Pierre II Migeon and this bureau plat, with its vernis Martin in imitation of exotic Oriental lacquer, would almost certainly have been commissioned through the intervention of a marchand-mercier. As the Inventory taken following his death in 1763 clearly testifies, Dubois maintained an extensive stock of gilt-bronze mounts - 432 livres pesant de modèles de bronze, prisés 1 080 L - and the Rothschild bureau plat displays Dubois' characteristic foliate-wrapped chutes. These feature on both the Japanese lacquer secrétaire en pente, undoubtedly also supplied by a marchand-mercier and stamped with the C couronné poinçon, illustrated in A. Pradère, Les Ebénistes Français de Louis XIV à la Révolution, Paris, 1989, p. 170, fig. 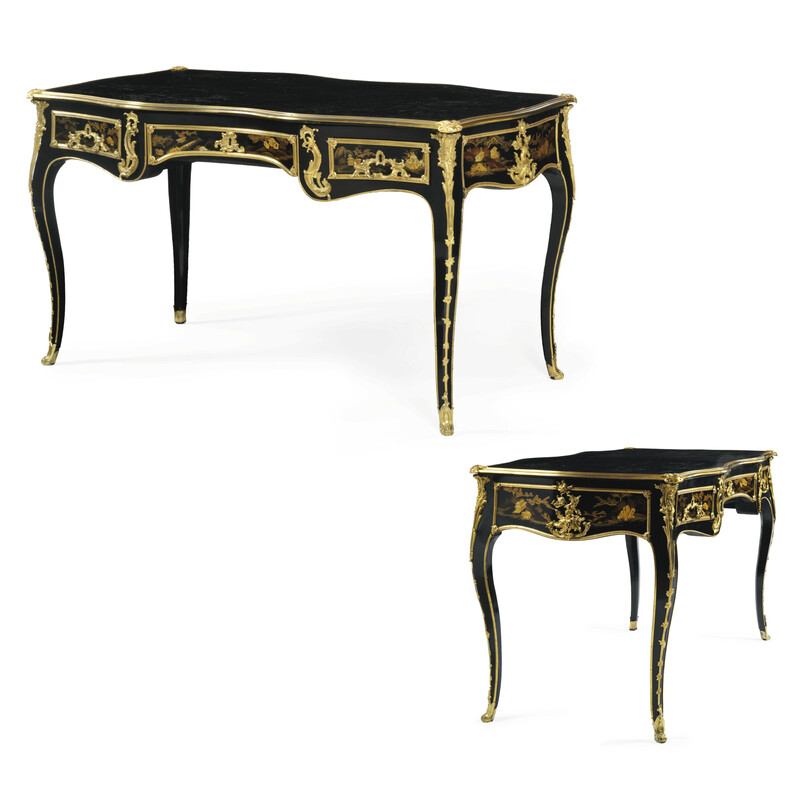 148, as well as on the bureau de dame sold from the Alexander Collection, Christie's New York, 30 April 1999, lot 140. Intriguingly, the stylised foliate-spray clasp to each end does not appear to have been exclusively owned by Dubois, as it appears on another Rothschild bureau plat by BVRB, veneered in amaranth and Chinese lacquer and stamped with the C couronné poinçon, which was offered at Christie's London, 10 June 1993, lot 34. BVRB worked almost exclusively for the marchands-merciers, particularly Thomas-Joachim Hébert, Lazare Duvaux and Simon-Philippe Poirier and, like Dubois, is thought to have either cast his own mounts or ordered his bronzier or marchand to retain the models for his exclusive use. The presence of this shared mount between Dubois and BVRB would seem to suggest, therefore, that either the same bronzier or, more probably marchand, was involved in both commissions. A further parallel, although more removed, can be drawn with the mounts of another contemporary, Joseph Baumhauer, dit Joseph, who displayed similar rectangular drawer frames with cabochon-clasps to the angles on the Japanese lacquer bureau plat in the Louvre (illustrated in D. Alcouffe et al., Furniture Collections in the Louvre, I, Dijon, 1993, no. 59, p. 189). Although Dubois was certainly supplying furniture with Oriental lacquer and vernis martin decoration from at least the late 1740s, the enduring popularity of his Chinoiserie furniture is further confirmed by the 1763 Inventory. Amongst the numerous examples of furniture de la Chine and du Japon was 1 bureau de vernis de la Chine garni de bronze, 220 l.
Le Goût Rothschild has become a byword for the prodigious collections assembled by this legendary family, and those created by the Viennese Rothschilds were among the most remarkable for their scale and magnificence. The collection was housed in a series of palatial residences, created by Anslem von Rothschild on Renngasse, and his sons Nathaniel (1836-1905) on Theresianumgasse and Albert (1844-1911) on Heugasse. They also owned hunting lodges at Hohe Warte in Austria and Schloss Schillersdorf in Czechoslovakia. The sale by Christie's in 1999 gives an idea of the extraordinary scope and magnificent quality of the original collections, with superb Dutch Old Masters, rare classical carpets, silver and early manuscripts. The French furniture assembled by the Viennese Rothschilds is among the finest ever assembled, andn included masterpieces such as Louis XVI's commode from his bibliothèque at Versailles, which was acquired at the sale in 1999 by the French nation and returned to Versailles, Joseph's bureau à pupite for the Comte de Cobenzl, sold from the collection of Hubert de Givenchy by Christie's in 1993, and Dubois' crowning work, the extraordinary corner cupboard designed by Nicolas Pineau and supplied by Dubois through the marchand-mercier Lullier of Warsaw in 1753 for Count Klemens Brenicki, now in the J. Paul Getty Museum, Los Angeles.